This month sees the 10th anniversary of the 2009 Victorian Black Saturday bushfires, when 173 people lost their lives. 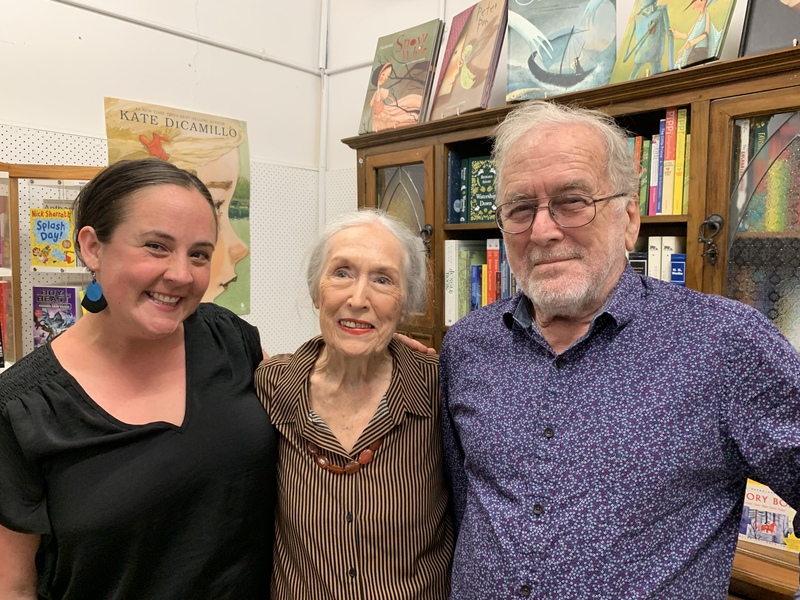 Ella Holcombe & David Cox’s new book, The House on the Mountain, captures the intense drama of that devastating natural disaster, and the long process of healing and rebuilding. 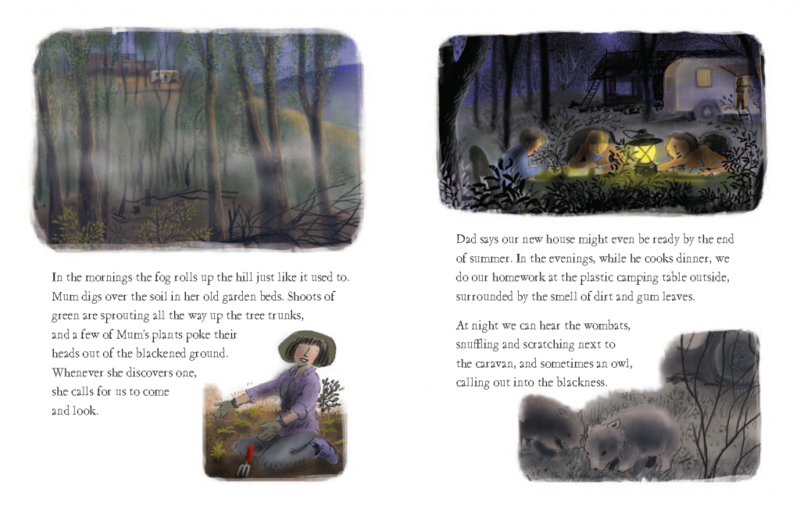 Ella Holcombe wrote The House on the Mountain as a tribute to her parents and a love letter to her childhood. 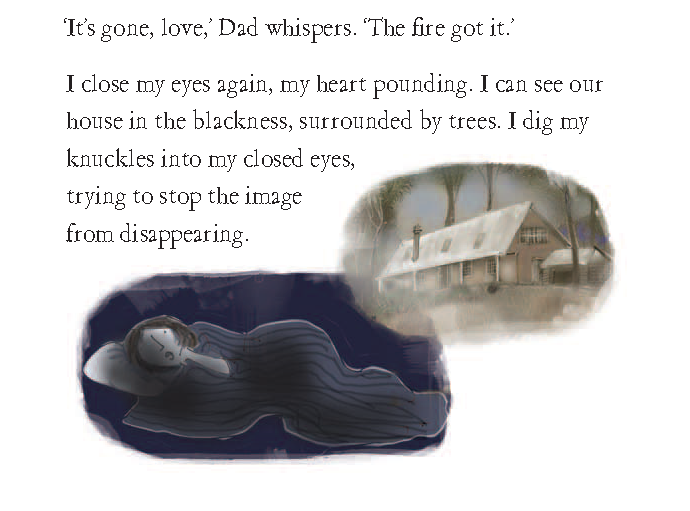 The fictionalised story delivers a gentle and beautiful message of hope, regrowth and renewal, using the house in the book as a symbol. 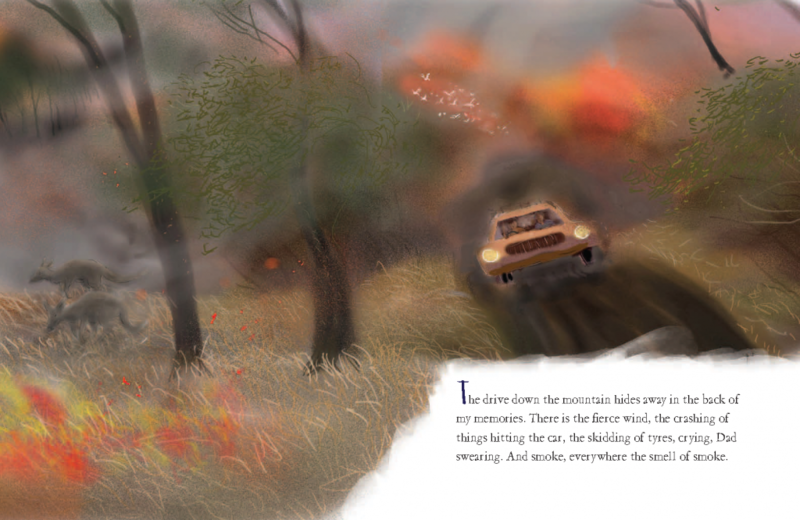 David Cox’s stunning, sensitive and often joyful illustrations do justice to this moving and important story, which offers a non-threatening way in which to discuss natural disasters with primary-school-aged children. David worked from photo references of the family and house in the eighties, so while the book is fictionalised, the house he has drawn is an homage to the real thing. The little girl in this story began her life as me. The twins were once my brothers, the parents my mum and dad. Ruby was our dog, Brittany. 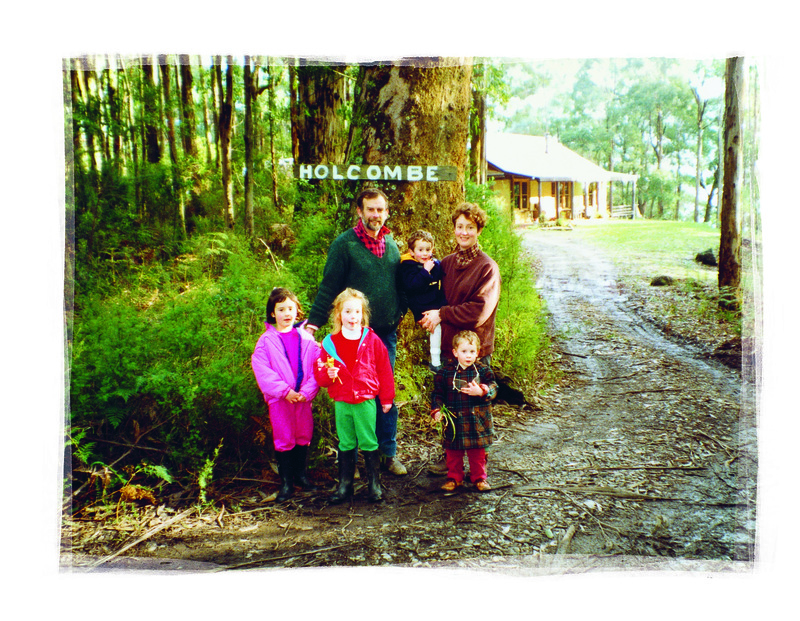 From left to right: Ella, her good friend Zoe, Dad, Patrick, Mum and Eugene, at the end of their driveway in 1989. Photo courtesy Louise Russell. 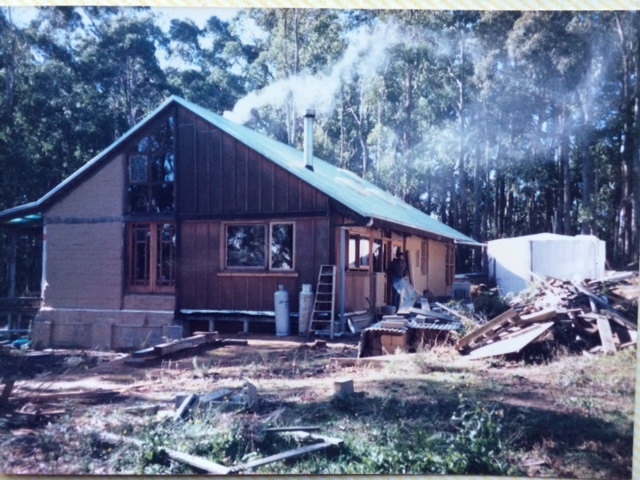 When I was born, Mum and Dad brought me home to their bush block in Kinglake. We lived in a tiny caravan while they built a shed, and then moved into the shed while they built their house. By the time my brothers were born, we were living in the house, similar to the one you can see in this book. 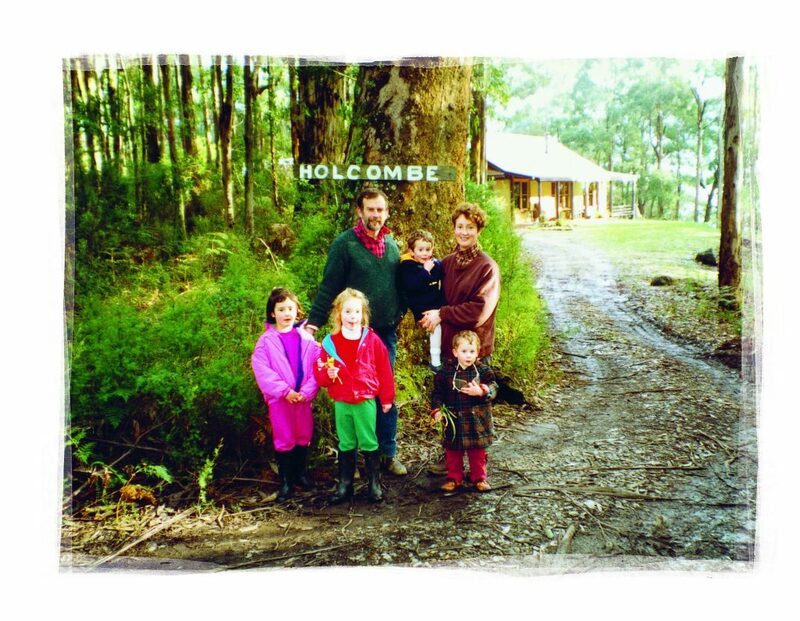 Much like these kids, we spent a lot of our childhood outside, roaming the bush. On 7 February 2009, there was an enormous bushfire in Victoria. A hundred and seventy-three people died, and thousands of people lost loved ones, homes, pets, possessions and more. That day became known as Black Saturday. My brothers and I lost our mum and dad, our home, and our beautiful Brittany that day. I could have written that story, but I knew it too well already. Instead I wanted to capture something else – something about continuity, about movement and regrowth. My brothers and I still own the block of land on top of the mountain. 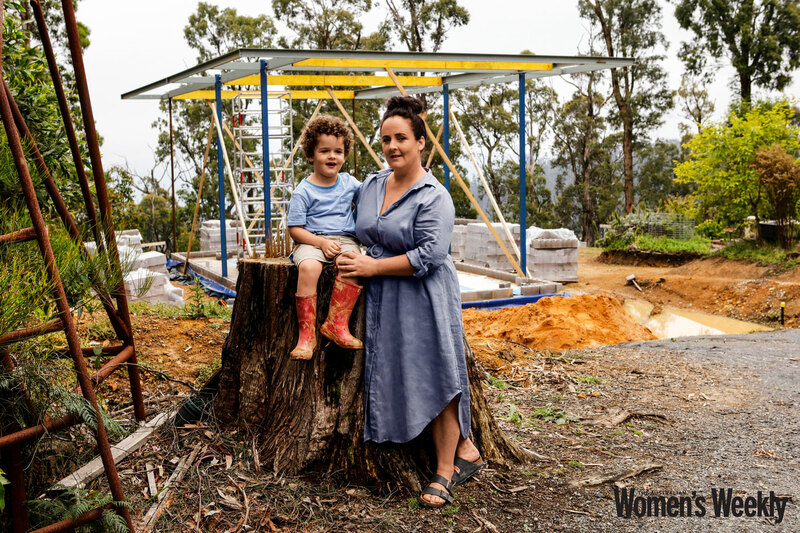 At first, we had a few caravans up there, then we built a shed, and we’re about to start building a house. We were there from the beginning, when everything was still black, and the wind howled through spaces where the bush once was. We watched tiny shoots of green appear from trees we thought had died. And we were surrounded by friends who came up to help. Now I watch my own son playing among the trees where our house once stood. I wanted this story to be about more than loss. Because family and home are bigger than that. This is for you, Mum and Dad. Thanks for letting us roam. In between starting to rebuild her parents’ house with her brothers and to rebuild her life, Ella somehow managed to find time to write an astonishing, redemptive story for young people about her family’s tragedy. There are so many remarkable poetic descriptions in this book: the hills are ‘bald, with black spikes where the trees used to be’; the powerlines ‘dangling like broken guitar strings’. 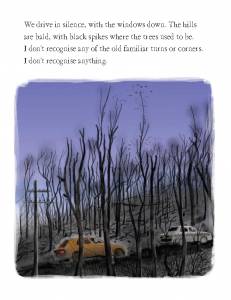 And the illustrations are gorgeous and moving too – they’re the work of David Cox, a fabulous artist from Queensland. But what’s most impressive about The House on the Mountain is how Ella manages, in the voice and via the consciousness of an innocent schoolkid, to convey the trauma, the wrenching emotional upheaval of a disaster like Black Saturday. 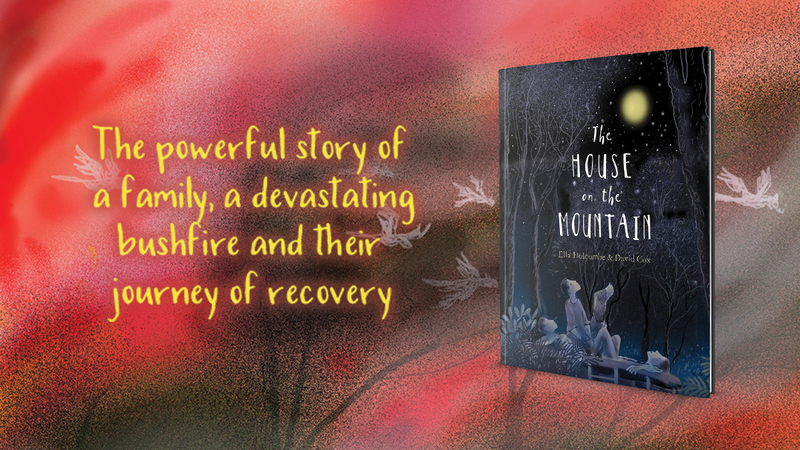 This push and pull of memory – trying to forget some things, while desperately holding onto others, both impossible tasks – is captured in The House on the Mountain with understated, yet devastating, effect. The remarkable achievement of The House on the Mountain is that as well as being a story about devastation, it is equally a story about hope and renewal. 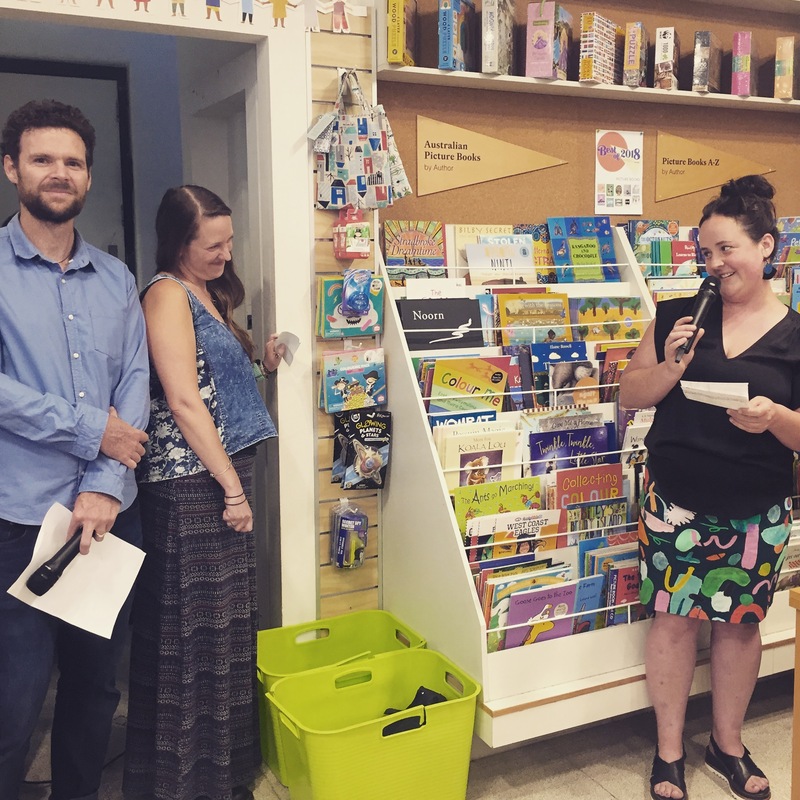 Ella has also taken a complex personal story and, from it, distilled an archetype, almost a fable: a quintessentially Australian story that is relevant, all too relevant, across Australia and into our climate-changed future. 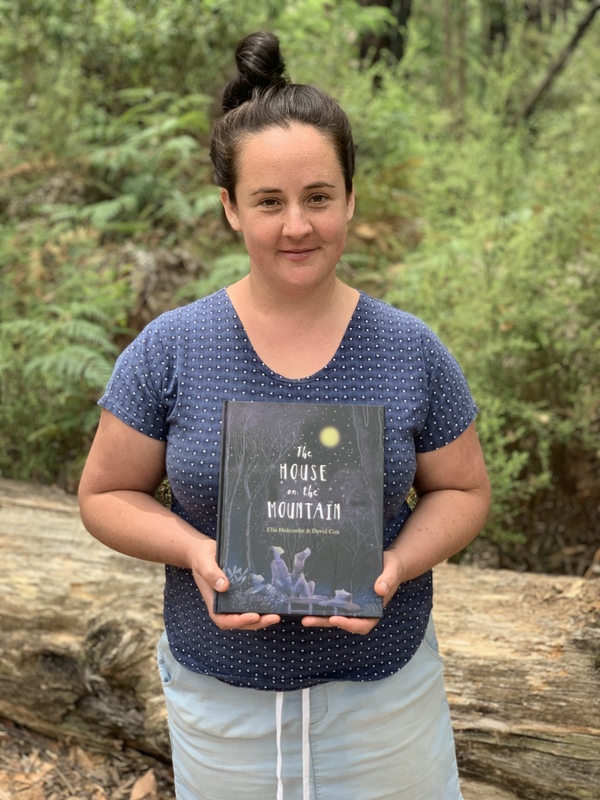 Watch a preview below as Ella reads from The House on the Mountain for Storybox Library (or view the full reading here), who also have a lovely interview with her on their blog. In this ABC news article Ella and her brothers share their thoughts on their childhood, the Black Saturday disasters, and reclaiming the mountain and their family home. 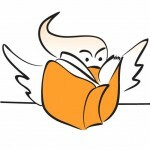 Teachers’ notes are also available on our website for advice on using the book in the classroom. 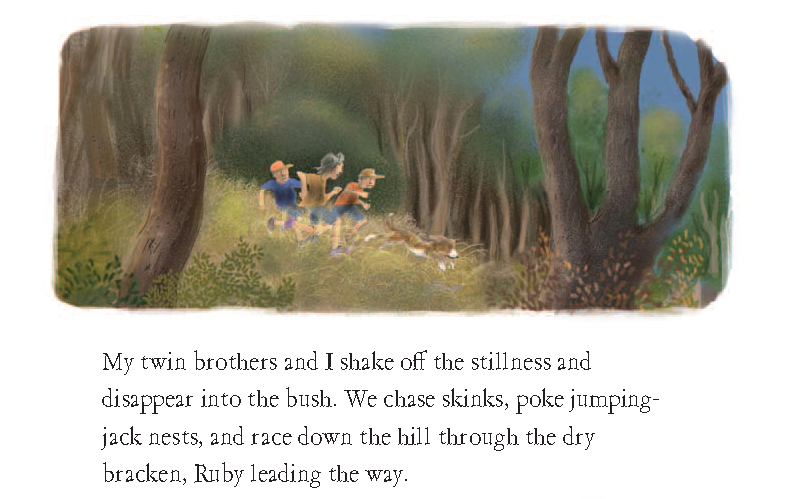 This story is set in Kinglake, on traditional Wurundjeri land. We wish to acknowledge the Wurundjeri people as the Traditional Owners and Custodians of this land, and pay our respects to their Elders past, present and emerging. Wurun means manna gum, and djeri is the word for the witchety grubs that live in and around these trees. So Wurundjeri means Manna Gum People, or Witchety Grub People. Thank you to Aunty Alice Kolasa, Wurundjeri Elder, for generously providing the beautiful acknowledgement of country above, which is included in the book. 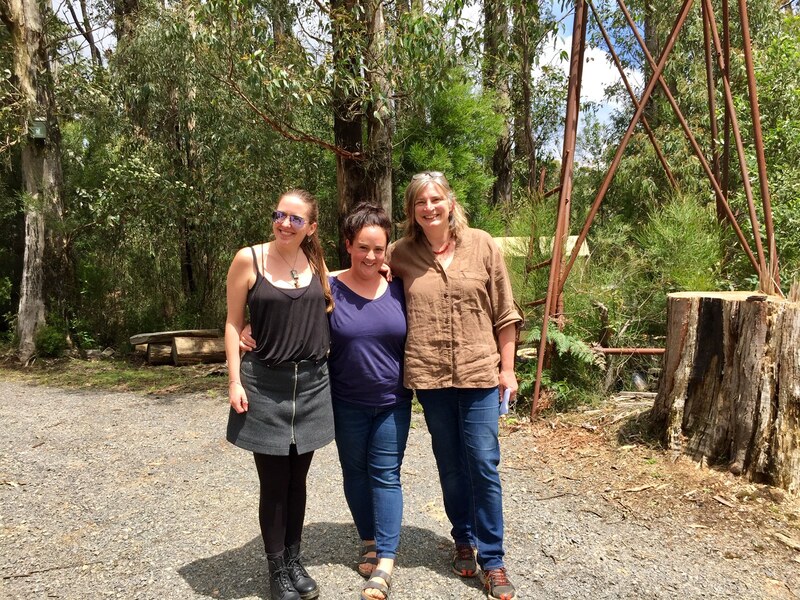 Ella, with her editor Elise Jones (left) and publisher Erica Wagner (right), at the Holcombe property on Wurundjeri land.